This article is partly based on a talk given at a Khamsin public forum in February 1980. An earlier and briefer version of it appeared in Issues, May 1980. The present article has since been expanded and new sections have been added. Almost two years have elapsed since the fall of the shah and the establishment of the Islamic regime in Iran. Whereas before and shortly after the February 1979 overthrow of the monarchy in Iran events in that country were given prominent, and often exuberant, coverage in the pages of the left press, it has since been demoted to occasional references concerning this or that new repressive move by the regime or, more frequently, the trotting out of the same old rhetorical cliches against US imperialism and other familiar non-problematic targets. It is no exaggeration to say that literally none of the expectations, predictions and prognoses of left circles, whether inside or outside Iran, have been confirmed by the passage of time. The speed with which a highly repressive and deeply reactionary regime has emerged, in the wake of colossal mass mobilisations involving millions, has left many in political shock and disillusionment. There are lessons, however, that have to be drawn, particularly for revolutionaries from Muslim societies; for it is clear that an Islamic 'alternative' has succeeded in gaining mass political allegiance in Iran. The repercussions are not limited to that country alone. Signs of shi'ite revivalism are evident in Iraq and other Arab countries. A new growth of pan-Islamism seems likely. To avoid impressionistic generalisations and hasty conclusions, a thorough critical balance-sheet of Iranian events from a revolutionary socialist viewpoint is long overdue. I. What really happened in Iran? The key to understanding the events of the past two years in Iran is the character of the mass movement. At its height, the struggle against the shah engulfed the overwhelming majority of the urban population in street demonstrations involving the most enormous mass mobilisations since the Chinese revolution. The very breadth of the movement, and the fact that it was fighting one of the world's most repressive and powerful dictatorships, presented a picture too alluring to be marred by any unpleasant observations about its goals or leadership. The apparent ability of the Islamic clergy to dominate events was dismissed as incidental. It was often simply denied that the Islamic hierarchy genuinely commanded mass allegiance. Alternatively, those who were unable to convince themselves that Islam was secondary or irrelevant, fastened their gaze in another direction.. Perhaps the mullahs did stand in the forefront of the movement, but if so, it was primarily because of their intransigent opposition to the shah. The implication was that masses of people could not possibly be drawn into action around a mystical or backward-looking programme. Or if they were temporarily so moved, their consciousness would automatically undergo a progressive evolution as the struggle unfolded. In fact, there is no reason, logical or sociological, why the oppressed cannot be mobilised in a sustained fight for reactionary objectives. Indeed, history is sadly laden with such instances. Moreover, far from being an empty abstraction, a political system based on Islamic precepts is inherently retrograde, regardless of the forces opposing its establishment. A reactionary struggle is not rendered progressive simply because its opponents are themselves reactionary. Despite its mass character, the anti-shah movement was not undifferentiated. Its politically coherent core was made up of the traditional urban petty bourgeoisie, organised through the many mosques and various religious societies. The political and social programme behind which these masses mobilised was embodied in the concept of 'Islamic government'. The shi'ite clerical hierarchy, the theological student body, and the many young enthusiasts finding the embodiment of their social ideals in Islam provided the ideologues and political leaders with whose aid the traditional petty bourgeoisie was able to draw the rest of the urban population in its wake. In its upper range, this traditional petty bourgeoisie overlapped, sociologically and politically, with sections of the traditional traders of the bazaar and with a certain portion of the bourgeoisie that had remained unconnected to the state apparatus that burgeoned around the Pahlavi court and its entourage since the late 1950s. This section of the bourgeoisie lacked access to one of the crucial mechanisms of 'primitive accumulation': state handouts and subsidies. Since state agencies dominated most investment opportunities, this sector was deprived of outlets by its lack of access to top state functionaries. The political representatives of these layers were the remnants of the National Front, headed by Sanjabi, and the Freedom Movement, headed by Bazargan. Since the days of Mosaddeq in the late 1940s and early 1950s, the National Front had lost much of its social base and most of its political influence. Part of the former was integrated into the growing modern bourgeoisie, finding its place in the new state apparatus and taking full advantage of a booming economy. Another significant part had declared its disillusionment with the National Front by breaking away in the early 1960s and founding the Freedom Movement, an attempt to amalgamate Iranian nationalism and Islam and thus to mend relations with the more traditional religious currents. In its lower reaches, the traditional urban petty bourgeoisie shaded into the multi-million masses of urban poor: pauperised artisans and shopkeepers and uprooted peasant migrants. The already appalling living conditions of the urban poor became unberable as the Iranian economy sank into crisis in 1975-76. By the time of the Amouzgar cabinet (1976) unemployment was approaching one million and the official inflation rate stood near 30 per cent. Rising unemployment and inflation made everyday life precarious and inculcated in the urban poor a desperation that would later find expression in militancy. Their traditional fatalism and longing hopes for a better life were fused in the promised paradise of social justice offered by the clergy under the banner of Islam. The absence of any unemployment benefits or other welfare and social services gave the clergy the unique opportunity to disburse part of their traditional charity funds (zakât) in order to lend some material force to their promises. The major battalions of the working class entered the fight in the last few months before February 1979. Deprived of any independent politicalor organisational experience as a class, disillusioned by the failure of both 'socialism' (as embodied for them by stalinism internationally and the Tudeh Party nationally) and bourgeois nationalism, and impatient with parliamentarism of the National Front, the working class let itself be drawn behind the petty bourgeoisie. The Islamic ideologues used the calamities of 'communism' and the collapse of nationalism as evidence of the inevitability of the rise of Islam: Cambodia and Egypt became their favourite talking points. The Mujahdeen's reinterpretation of Jame'a Tawhidi (unitarian society) as the classless society was an instance of the ideological aberrations through which the working class was enticed to the utopias of the petty bourgeois masses. The impact of capitalist development in Iran over the past two decades threatened the very existence of the traditional urban middle class. Innumerable independent small producers and distributors were driven into bankruptcy by factory production of traditional consumer goods and the emergence of large-scale distribution networks. Others barely survived by intensifying family labour and reducing their living standards. Still others, who enjoyed some increased prosperity because of the relative expansion of the internal market, nevertheless resented the striking widening of differentials in income and living standards. They were also hit in 1975-77 when the shah reacted to worsening economic difficulties by making further inroads on small-scale production. Bank credits were restricted, import controls relaxed, and import tariffs lowered. Campaigns against 'over-pricing' hit this layer hardest. But it was a revolt against the present and the future, to reconquer a mythical past that had never really existed. In a sense it was a 'revolt against history', as 'Ali Shari 'ati had called shi'ism. The ideological origins of shi'ite Islam itself provided the starting point. Islam generally was suited to become the ideology of a society based on commerce and petty commodity production; but shi'ism in particular prided itself on being the 'idealist essence' of Islam. It arose as a revolt against the institutionalisation of an Islamic state structure, to which it counter-posed primitive semi-tribal patriarchal custom. Its inevitable defeat drove it increasingly into obscure mystification in the name of preserving the purity of Islam. This endowed shi'ite Islam with a rich historical tradition of protest and martyrdom. In Iran, the many shi'ite sects had provided the organisational and ideological medium for repeated urban and rural revolts. Since it lacked any coherent vision and was inherently contradictory (fighting the existing governmental authority, but also denying the authority of any government in the absence of the Twelfth Imam), it usually led those protest movements to martyrdom rather than salvation. Its one famous success, the Sarbedaran revolt (mid-fourteenth century in western Khorasan), was short-lived. And shi'ite authorities deny that the Safavid period (sixteenth century) represented a true shi lite experience, since the Safavids, once in power, abandoned shi'ism and became corrupt earthly rulers. In mid-nineteenth century Iran the clergy again provided the cadre and ideology for revolt. That experience, however, was quite different from the present one, as we shall see. A combination of current economic, social, and political factors has now given shi cite Islam a unique and wholly unprecedented opportunity to actualise its programme. Not only have political and social factors made it a plausible alternative to wide sectors of the population, but probably for the first time in the turbulent history of shi'ism economic conditions are exceptionally favourable to its project. Never before has an autarkic national economy been as potentially viable in Iran as it is today. The country has sufficient natural resources to provide for domestic consumption, particularly once Khomeini 's austere standards are imposed on the mass of the population. What it lacks in resources, it can simply buy with oil revenues. No other contemporary social formation is so well placed to adhere to the motto 'small is beautiful'. In the long run, of course, trends towards class differentiation and capital accumulation will compel the Iranian economy to open up once again. But in the short run economic autarky will permit the most reactionary policies. Moreover, the traditional political-ideological contradiction of shi'ism has been resolved through the concepts developed in recent years by Shari 'ati and Khomeini. Shari 'ati has emphasised that the task of government is properly the province of an elite that understands shi'ism and thus deserves to lead the rest of the community. Khomeini's essay, Velayat-e Faghih (first published in 1971, and often referred to as The Islamic Government), develops the same notion of clerical political responsibility more systematically, explicitly designating the clergy as the governing elite. It is undeniable that other forces and social classes that backed the revolt of the urban petty bourgeoisie did not share its 'historical vision'. Sectors of the bourgeoisie and the bazaari supporters of the Islamic Republic hoped for a 'rationalisation' of capitalism and 'democratisation' of the dictatorship. They yearned for access to state power and a larger, 'more just' share of the internal market and its investment opportunities. In backing the clergy and Khomeini, their political representatives, the National Front and the Freedom Movement, were reviving their traditional alliance with the shi'ite clergy. The top echelon of the clergy, always closely linked to the merchants of the bazaar, provided the natural ligature of the alliance. Attention has sometimes been drawn to a similar alliance of bourgeois nationalists and the clergy during the 1905-1911 Constitutional Revolution. The contrasts, however, are more striking than the analogies. The bourgeois nationalists had the upper hand in the constitutional movement, barely tolerating their clerical allies. Seventy years later the opposite balance obtains. the clergy dominating its bourgeois allies. In the constitutional movement the clergy attempted to formulate religious justification for what were then new concepts of parliamentary democracy. Clerics laboured to demonstrate that all western constitutions were 'actually' derived from the Islamic shari'a (legal code), which meant that democracy was 'Islamic'. Seventy years later, the bourgeois nationalists of the Freedom Movement and the National Front were striving to weave a democratic cloak for Islamic theocracy, trying to show that Islam is the most democratic system. In the Constitutional Revolution, it was the bourgeois nationalists who enjoyed mass support for their concepts of political democracy and constitutional reform; they succeeded in out-manoeuvring the clergy, and introduced a constitution that declared that 'the national government is derived from the people'. Seventy years on, the popular imagination, disappointed by the bourgeois nationalists, disenchanted by what they knew as 'socialism' , and repelled by the record of the Tudeh Party, was gripped by the clergy. Betrayed by earthly doctrines, the masses put their trust in heavenly promises. With this support, the clergy was now in a position to take its revenge against its secular allies. Khomeini's 'experts' have drafted a constitution that declares that the Islamic Republic is based 'on belief in God, and on the principle that government and tashri' (legislation) belong to God, and on the willingness to accept submission to His orders'. It was now the clergy's turn to out-manoeuvre the bourgeois nationalists by establishing their theocratic state. 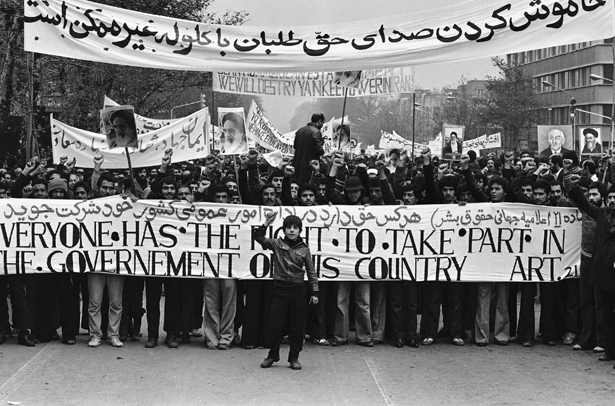 It is quite evident that nearly all components of the mass upsurge against the shah's dictatorship supported the idea of the Islamic Republic (as indicated by the overwhelming vote in the referendum of 30-31 March 1979). But, except for the bastions of the traditional urban petty bourgeoisie, this support is merely a result of their false identification of their own demands and aspirations with the programme of an Islamic Republic. The public-sector employees and the working class, whose prolonged general strike halted the very functioning of the shah's regime, were fighting for improved social conditions and democratic rights, such as freedom of press and association, freedom of trade-unions, and the right to strike. But given the overwhelming political hegemony of the clergy in the anti-shah movement, these progressive struggles and tendencies could have come to fruition only if they had broken from the clergy and comeforward as an independent pole of attraction. Once the clergy captured state power through the events of February 1979, the clergy, now wielding the weapon of the state, became an immediate and mortal threat to any advance of the class struggle. The reason for this lies in the very nature of 'Islamic government'. Islam is not simply a system of religious thought and practices regulating the mystical relation of man to 'his god'. It is above all a body of social, economic, and political precepts on whose basis the Islamic community is to be governed in its earthly existence. The particularly reactionary and dangerous character of the clergy's hegemony does not arise primarily from its particular social and economic policies, although these are reactionary enough, ranging from oppressive laws against women to reactionary populist-sounding schemes, like trying to eliminate unemployment by granting each unemployed person a small amount of capital to set up a small workshop, or granting each homeless family land and construction materials to build its own hovel. Rather, the most menancing feature of the clergy's rule stems from its concept of government, as formulated in the many writings on the subject by Khomeini and others, and as implemented since February 1979. Government, the clerics maintain, is properly the business of the direct representatives of God on earth. The task of ruling is reserved for the spokesmen of God, and in the last instance for the supremeJaghih (the person most knowledgeable in Islamic law), final arbiter of what is good for the Islamic community economically, politically, morally, and socially. The scope of control extends even to the most trivial details of everyday life. Islamic government is the government of the laws of God over people. This is the main difference between Islamic government and constitutional monarchies or republics. That is, in the latter types of government the king or the representatives of the people engage in the act of legislation, while in Islam the legislative power, the act of tashri', belongs solely to God. The holy Islamic shari'a is the only legislative power. No one else has the right to legislate. No law other than the divine decree can be implemented. For this reason, in the Islamic government instead of a legislative assembly. . . one has only a planning assembly that arranges the work of different ministries according to Islamic laws. The body of Islamic law, as collected in the Koran and the sunna, is accepted and obeyed by the Muslims. This acceptance and agreement makes the task of government easy. .. The Islamic government is a government oflaw, the governing belongs to God, and the law is the law and order of God. Islamic law, that is, the divine decree, has absolute authority over everyone and over the Islamic government. If the rulers are to follow Islam, they must follow the faghihs about the laws and decrees. Under such circumstances, it is clear that thefaghihs are really ruling. Therefore the act of government must formally belong to thefaghihs and not to those who due to their ignorance of the law must follow the faghihs. . . These characteristics of knowledge in law and justice are present in many of our contemporary faghihs. If they get together, they would be able to form a just government throughout the world. If a suitable person who has these two characteristics arises and forms a government... obedience to him is obligatory upon all people. Independent thought and action have no place whatever in such a system of government. Mass activity is encouraged only when it unfolds under the control of the faghihs or in their support; it is ruthlessly crushed the moment it steps beyond such limits. Complete conformity is the rule. This is only logical in a system whose final authority rests beyond human judgement. What is most dangerous in this project, and distinguishes it from others, is that it is based on the complete negation of all popular sovereignty; the rulers are not accountable to the ruled even in theory. The nefarious effects of this project on the consciousness of the workers and urban and rural poor should not be underestimated. The consolidation of Khomeini 's authority, backed by his success in ousting the shah, has increasingly meant surrender by the masses of all their confidence and independence in favour of trust in God and obedience to his Imam. Since February 1979, important struggles and strikes in factories and in the army have been stifled not through armed force or the threat of force, but at the order of the Imam. Efforts to implement this political project have been at the centre of events in Iran since February 1979. On each major issue the clergy has set itself in opposition to progressive change, the exigences of Islamic government contradicting those of social progress. Consequently, mass participation in efforts to recast Iranian society implicitly threatens the Islamic project, unless directly controlled by clerics or their agents. The success of the clergy's political rule therefore hinges on its ability to check or suppress all the independent struggles that had arisen with the crisis and collapse of the shah's regime: the struggles of the nationalities for self-determination; the fight for democratic rights; the struggle of women for equality; and finally, some primarily economic struggles of workers and peasants. These latter have been contained quite easily. In and of themselves, the struggles of workers for higher wages and better working conditions, of the unemployed for jobs, and of the peasants for land pose no particular challenge to the political project of the clergy. On the other hand, the struggle for independent workers' and peasant organisations had been led into the blind alley of corporatist Islamic councils, with the obliging cooperation of the confused left and the theoretical elaborations of the Mujahedeen. Two years after the collapse of the Pahlavi dictatorship, no independent workers' movement exists in Iran. Inevitably, conflict on the issue of women's rights followed the seizure of power by the clergy. Islam upholds unambiguously reactionary and oppressive codes and laws for women. Any move towards implementing them was bound to meet strenuous opposition from those women who had hoped that the overthrow of the shah's regime would open a new era of the flowering of their rights. Despite the vicissitudes of women's struggles during the past two years, this remains one of the major 'problem' areas for the clergy. It also offers one of the key challenges and hopes for revolutionary socialists. (These issues are discussed in greater detail in 'Enigma of the Veiled Iranian Woman', Feminist Review no 5, 1980.) For the first time in the history of of Iran, the nature of the political regime makes quite likely the emergence of a women's movement similar to the suffragist movements of latenineteenth and early-twentieth century Europe. Issues of legal and political equality will tend to come to the fore of women's struggles. The collapse of the highly centralised Pahlavi state naturally set in motion a fresh round of battles for national self-determination all over Iran, a patchwork of nationalities and ethnic groupings. The modern state was born of the bloody suppression of national struggles and has indulged in continual acts of repression to forstall any new uprisings. Any endeavour by oppressed nationalities to determine their own fate, in particular to erect their own political structures, had to clash with the clergy's project of instituting a centralised theocracy. That the majority of these nationalities and ethnic minorities are sunnis aggravated the issue. Since February 1979, there have been intermittent clashes between Khomeini's supporters and the forces for local autonomy or self-government in Gonbad, Khuzistan, Kurdistan, Baluchistan, and Azarbaijan. Despite the vicious, chauvinist campaign launched against the Kurds in August 1979, Khomeini's forces did not succeed in defeating them. In the other regions the relationship of forces has been more favourable to the regime. The single greatest obstacle to the consolidation of clerical rule has remained the struggle of the oppressed nationalities, especially the Kurds. The collapse of the shah's dictatorship temporarily ended a twentyfive year period of suppression of all democratic rights. The flood of newspapers and books, the gatherings and meetings that proliferated in workshops, universities and schools, and the formation of political parties and other associations, including the many grass-roots committees, all reflected the popular thirst for democracy. Contrary to a common misconception on the left, the numerous committees that sprang up throughout the country during the first few months of 1979 were in no way soviet-type formations. Most of the neighbourhood committees were set up through the local mosques, directly under the clergy's control. Other committees, set up at workplaces, colleges, and secondary schools, often began as strike committees and nearly always remained concerned with local issues, or with coordination of mobilisations against the shah's regime (in support of the journalists' strike against censorship, for example). Some of these committees were taken over by Khomeini's supporters after February 1979 and quickly lost all independence. Where they remained genuinely independent bodies elected by workers, employees, or students, they devoted themselves exclusively to local issues of this or that factory, office, or school. At no time did these bodies begin to act (or conceive themselves) as organs of a new power. Primarily they reflected a genuine desire for grass-roots democracy that remained limited to local issues. Exactly for this reason, the new rulers found it relatively easy gradually to transform these bodies into corporatist consultative councils. The highest degree of political development occured in the south, amongst oil workers, whose council issued a statement calling for a workers' representative to be placed on the Revolutionary Council, since 'workers had played such a significant role in the downfall of the shah'. Even this modest proposal, however, was never followed up by the workers. But the very existence of such independent committees, the outpouring of newspapers and books, the formation of parties and organisations, and the exercise of freedom of speech and assembly inevitably threatened the establishment and consolidation of the government of God on earth. In the first months after it came to power, Khomeini's regime set out systematically to stamp out this threat. There were two periods in this process, separated from each other by the August 1979 attacks against the press, the left, and Kurdistan. In the early period, the regime was not capable of launching an all-out assault, nor was such drastic action necessary. Despite the attempts of the leading factions around Bazargan and Khomeini to effect a smooth transition of power that would preserve all the main military and repressive instruments of the state intact, the bulk of the Iranian army collapsed and SAVAK premises were taken over and often burnt down during the February 1979 days. Several months of confronting mass street demonstrations had severely undermined the morale of the soldiers, leading to widespread desertion and indiscipline. The execution of many leading figures of the army and SAVAK (advocated and implemented by Khomeini's supporters over Bazargan's objections) further sapped army morale, especially among the officers. What remained of the army was an ineffective body whose soliders were temporarily more concerned with experiments in rank-and-fiIe democracy than with drills and other army exercises. The reconstruction of the army, or the construction of new repressive instruments such as the Islamic militias, the Pasdaran, required time. Meanwhile, political preparations were under way to demoralise and demobilise those sectors of the mass movement that were not politically shaped and organisationaIly dominated by the clergy. Months of careful preparation preceded the August 1979 crackdown, the regime testing the balance of forces as it went along. (The move against certain newspapers in June 1979, though unsuccessful, was one example.) The leitmotif of Khomeini 's policy during the pre-August period was the elimination of any popular participation in directing the affairs of the country independent of the clergy. Independent committees were often dissolved; non-conformist elements were demoralised and driven out of those that remained. The foundation for later political developments was laid by the referendum on the Islamic Republic. The oftpromised constituent assembly was postponed several times. Had such a body been convened earlier, an even more solid and genuine majority for Khomeini's supporters might have been returned. But early elections would have run against the long-term political goals of establishing a 'chosen' (as opposed to an elected) government. It would have strenghtened that element in mass consciousness that favoured free and democratic elections and an elective system of government. Elections had first to be reduced from a positive action of a determinative character to an act of consultation or mere ratification. The majority of the population (and not just the solid bastions of the urban petty bourgeoisie) had to be either demoralised and reduced to political apathy and inactivity or convinced that only 'Islamic experts' are fit to govern. Concepts of political democracy were deemed 'western', 'corrupt', and defunct. After all, wasn't the whole system of imperialist exploitation based on bourgeois democracy? So the argument went. Primitive populism was declared superior. For months hesitant discontent was held in check by constant harping on themes such as 'the threat of counter-revolution', 'the danger of restoration', 'the impending imperialist and zionist intervention'. Meanwhile, the imposition of Islamic codes began to drive home the message that this was going to be a genuinely Islamic government. The left was most obliging to the clergy on the former themes, and kept silent on the latter. Some may have shared the prudish and cruel codes of behaviour the clergy was imposing. Others dismissed them as irrelevant details of no real concern to the working masses. When the clergy began executing prostitutes, for example, not a single voice was raised in defence of the victims. By allowing the all-embracing imposition of Islamic codes without challenge, the left effectively cooperated in preparing the rope for its own strangulation. Revenge against the past became the overriding theme of everyday life. This was not simply intended to divert popular attention from more 'mundane' problems of today and tomorrow, nor was it merely a means of fostering an atmosphere of generalised fear, terror, and uncertainty. It was, in addition, part of the revival of Islamic tradition and values, among which was the importance of revenge and punishment, as opposed to what Muslims have often considered the passive Christian tradition of forgiveness. The most important Islamic tradition to be revived, however, was the Friday prayers. Every major city and town in Iran today has a Friday Imam appointed by Khomeini, who unfailingly conveys the latest political message in his Friday khotba (the sermon preceding the actual prayer). Once the regime felt strong enough, it scrapped the constituent assembly in favour of a farcical 'Assembly of Experts'. The absence of any organised resistance to these 'elections' apparently convinced Khomeini that the time was ripe to rid himself of potential critics and irritants to his rule. He understood the meaning of the large rate of abstention -less than half the electorate participated in the votemuch better than the left. Far from indicating an active boycott or rising dissent, it reflected the fact that disillusionment with the Islamic Republic was generating a mood of apathy and demoralisation. Most of the electorate felt that their votes were either futile or unnecessary. Those dissatisfied with the prevailing state of affairs were already feeling impotent, and some of the supporters of the Islamic regime felt secure enough not to bother with registering their support. In the aftermath of the election of the Assembly of Experts, a wave of protest by certain groups, including some of the clergy around Shari'atmadari, expressed belated grievances against the electoral practices, thereby signalling a potential threat to Khomeini's project. Feeble though these protests were, they were intolerable in a political system that demands total submission and conformity. The continued strength of the Kurdish movement also loomed as a danger to a centralised theocracy. It was time to put an end to the independent press, the left, and the Kurds, each of which, in varying ways, constituted an obstacle to the clergy's project. When we broke down the corrupt regime, and destroyed this very corrupt dam, had we acted in a revolutionary manner from the beginning, had we closed down this hired press, these corrupt magazines, these corrupt papers, had we put their editors on trial, had we banned all these corrupt parties and punished their leaders, had we erected scaffolds for hanging in all major squares, and had we chopped off all the corrupters and the corrupted, we would not- have hàd these troubles today. I beg forgiveness from the almighty God and my dear people. . . Had we been revolutionary, we would not have allowed them to express their existence, we would have banned all parties, we would have banned all fronts, we would have formed only one party, the party of the mustaz'afeen [the oppressed]. I ask for repentance for my mistake, and I declare to these corrupt layers all over Iran, that if they do not sit in their place, we will deal with them in a revolutionary manner. . . like our master' Ali, . . . who would pull his sword against the mustakbereen [the oppressors] and the conspirators, and who it is said beheaded 700 in one day from the Jews of Bani Qarantia, who were like the Israelis and maybe these Israelis are their descendants. .. These conspirators are in the same category as the kuffar [heathen], these conspirators in Kurdistan and elsewhere are in the ranks of the infidels, they should be dealt with harshly. .. The Prosecutor of the Revolution must close down all magazines that are against the popular will, and are conspirators; he must invite all their writers to court and put them on trial. He is obligated to call upon those who engage in conspiracies and call themselves parties, put the leaders of these parties on trial. . . those layers of the army who disobey [in failing to suppress the corrupters and the conspirators] must know that I will deal with them in a revolutionary manner. .. I demand of all layers of the population, of all intellectuals and of all parties and groups, whose number unfortunately now exceeds 200, that they follow the popular path, the path of Islam. . . otherwise they will become the victims of their own wrongdoing. . . Other nations must learn from our movement, . . . the people of Afghanistan must learn from Iran. . . We hope that the unity of the world of Muslims will solve the problems of Islam, the proble,ms of Palestine, and those of Afghanistan. The following day all independent newspapers were banned, headquarters of dissident groups were ransacked and the military campaign against Kurdistan was launched. This latter campaign proved unsuccessful in defeating the Kurds, but the press was silenced and the left marginalised. Today no paper is legal that dares to oppose Khomeini and the Islamic Republic. Those papers that have gained temporary legalisation have paid a heavy political price: capitulation to Khomeini. The events around the US embassy take-over, the holding of hostages, and the demand for the return of the shah accelerated theocratic consolidation and exacerbated the confusion and capitulation of the left. Just prior to the siege in November 1979, the Iranian situation was marked by increasing anti-government ferment -among the Kurds; in the universities; where issues of freedom of political debate had again be raised; among women, some of whom were beginning to organise against the new marriage and divorce laws, which repeal the small gains that had been made under the shah; among the workers, where there was a modest rise in economic struggles. The embassy siege, far from impelling these struggles forward, acted as a brake on them, simultaneously diverting attention from the real issues facing Iran and serving as an occasion for typical obscurantist calls for 'national unity', overlaid with the Islamic cast that renders this time-honoured reactionary appeal even more retrogressive. Khomeini was now in a position to blame all economic shortages on American sabotage; a huge propaganda campaign for the restriction of consumption was launched. All dissidents could now be branded as agents of US imperialism and suffer the wrath of the masses accordingly. Khomeini has used the occasion to implement what he had failed to achieve before; a massive mobilisation of youth into armed militias under the total control of the clergy and their henchmen and a reintroduction of discipline into the army. The effects of the events on mass consciousness has been hardly less lamentable. The complete diversion of the population's attention from real problems and enemies at home further set back the process of differentiation between Khomeini and his mass base and intensified the obscurantism and mystification that has marked the Iranian upheaval from the outset. The US embassy occupation and the mobilisations around it provided the regime with a favourable political climate for holding a referendum on the new constitution. This was followed by the presidential and parliamentary elections in early 1980. Once the elections were over, fresh attacks against the left and the nationalities ensued. New assaults against the Kurdish people began early in April 1980. Within two weeks these had developed into a full-scale civil war. The Iranian air force joined the army and the Islamic militias in mop-up operations of whole villages and towns. A new offensive against all dissidents was already under way with the attacks against the Mujahedeen headquarters during March 1980. By early April 'followers of the line of the Imam' were regularly attacking left headquarters on university campuses. Bani-Sadr personally moved in, legitimising these attacks by giving on April 18 a three-day ultimatum to all left groups to evacuate their university headquarters. These were the last public sanctuaries of the left since their other headquarters had been shut down in August 1979. In the ensuing days, Islamic thugs ransacked the left headquarters, causing thousands of casualties. Hundreds were arrested. Several executions followed. Bonfires were made of all leftist literature on the campuses. II. What prospects for socialism in Iran? In discussing the future development of the class struggle in Iran, two questions have to be clearly distinguished. First, there is the question of an assessment of the present balance of forces in the country and the likely tendencies of their development. Second, one must begin to develop a revolutionary programme for socialism in Iran. Notwithstanding the jubilation of the left in Iran and abroad over the issue of the US embassy takeover, the present political situation in Iran is not at all favourable for the struggle for socialism, as is shown by a cursory look at the state of affairs two years after the overthrow of the monarchy. The general trend of struggles independent of the clergy and its political programme has been on the decline, except in Kurdistan. The other nationalities and ethnic minorities have been unable to sustain any resistance since the attacks against the Arabs in Khuzistan in early summer 1979 and those against the Baluchis in autumn 1979. New attacks against the Turkomans were launched in spring 1980. Twelve leaders were found beheaded and a new climate against 'losing an inch of our national land ' was created in anticipation of fresh attacks against the Turkomans and the Kurds, followed by a full-scale war against them. The struggle of women for equal rights, which saw a modest revival in early autumn, was subsequently overshadowed by the embassy events and the presidential and parliamentary elections. But even the autumn 1979 mobilisations were much smaller than those of March 1979 against the compulsory veil. On that occasion nearly 20,000 women demonstrated, on only one day's notice, against Khomeini's edict on the veil. The autumn protests primarily comprised women from the far left and barely numbered in the thousands. The strict imposition of 'Islamic modesty' on women in the summer of 1980 evoked very limited and totally disorganised resistance. Censorship over the national media is in full force; the judiciary has been delivered from the clutches of SAVAK only to fall under the cloak of the clergy; no independent working-class organisations have emerged; the living conditions of the working class and the urban poor have deteriorated and are likely to continue doing so. What is most disconcerting of all, however, is the political polarisation that has emerged in the country. The bourgeois nationalist wing of the ruling alliance has been eliminated from the scene for all practical purposes. The majority of those who had supported Bazargan and his government in the first half of 1979 have now become his open enemies. Although this does reflect the impotence of this political current in dealing with the social problems facing the country, the celebration of much of the left in Iran is worse than misplaced. Far from signifying a leftward shift in the mood of the masses away from bourgeois liberalism, this polarisation has further strengthened the hegemony of the clergy and the appeal of its Islamic government as the only possible alternative. The growth of the left, on the other hand, has been minimal in this polarisation. Moreover, under deteriorating economic conditions coupled with a government repressive apparatus that remains weak, and in the absence of any avenues of progressive political struggles, there has been a rise of workers' economic struggles around unemployment, wages, hours and conditions of work etc. This has made daily life increasingly intolerable for the petty bourgeoisie and the bazaaris. They are clamouring for 'law and order', pressing for a rapid reinforcement of the central government. For the moment, they seem to have given their support, with Khomeini's blessing, to Bani-Sadr. To stay in power (and to save his own neck) he has to succeed in satisfying the demands for order. If he fails, there are other candidates for the job. The Partisans of God (Hezb-o Allahis) have been quietly organising and have grown considerably. The concerted attacks against Mujahedeen headquarters all over the country gave an indication of their forces. Regardless of the exact short-term balance of forces between different ruling factions, it must be emphasised that the period ahead for revolutionary socialists will be one of prolonged patient political education. Unless there is a victorious upsurge towards socialist democracy in the Soviet Union or a victorious socialist revolution in one of the imperialist countries (thereby giving rise to a new attractive image of socialism on a world scale), the majority of Iranians, in Persian-speaking areas in particular, have set themselves to experiment with their 'neither western, nor eastern, but Islamic' model. Within this overall context we can project the future of other political tendencies, as well as the tasks and programme of revolutionary socialism. For reasons already pointed out above, bourgeois nationalist currents of various shades, the National Front and the Freedom Movement, have no real future. The National Front, already in demise, has suffered further losses of its political figure-heads and social base. It has been reduced to commemorating its past, rather than projecting the image of a new future. The only significant initiative it has shown has been to celebrate Mosaddeq's birthday and commemorate the anniversary of his death. Over the summer 1980 period, in the aftermath of the uncovering of a coup plot, there was a systematic campaign to implicate the National Front in the coup plans. Its headquarters have been taken over by the Pasdaran, and it can no longer even publish a paper. The more radical offshoot of the National Front, the National Democratic Front, gained a certain momentum for a few months by organising opposition to the clergy on a secular and democratic basis, but it has not recovered from the physical attacks against its last demonstration in defence of freedom of the press in August 1979. The Freedom Movement, originally a breakaway from the National Front in the early 1960s, had set itself the task of governing the state on behalf of the clergy whom they thought should remain in the mosques to provide 'spiritual' leadership. With the clergy now in command of the state, there is very little room left for the Freedom Movement. In any case, it is quite unlikely that the masses, once they begin to break with Khomeini, would look towards political currents whose bankruptcy has been transparent for so many decades and who have no coherent alternative. The major groups on the secular left have a very small popular base, especially amongst the workers and the urban poor. They are stronger amongst students, white-collar workers and state-employees. All these groups - the Tudeh Party, Fedaeen, Paykar - have also politically capitulated to the clergy in various degrees. The Fedaeen and Paykar in particular are also politically very confused and heterogeneous organisations. It is difficult to see how they could offer an attractive alternative to forces breaking away from clerical rule. Within the Islamic framework there are many tendencies. Here is where a reshaping of the political map may take place in the coming years. These political currents range from the left reformism of the Mujahedeen, through different shades and factions within the clergy and political personalities related to them, all the way through to extreme right fascistic groupings such as the Hezb-o Allahis. The Mujahedeen have a substantial base in the working class and are influential in many of the workers' councils. They are the current most likely to grow in the coming years as an Islamic workerist tendency. On many vital issues they have held progressive positions and at times supported the struggles of women, nationalities and workers; nevertheless as long as they remain within an Islamic ideological framework they are bound to end up on the side of reaction when vital questions are posed (e.g., their silence on the attacks against the Kurds, and their åcceptance of Komeini's orders to evacuate their central headquarters). They have made their political trademark the question of the Islamic councils (shoras), advocating a governmental system based on them. These councils, however, as long as the Mujahedeen accept Khomeini's doctrine of vesting power and authority in the supreme faghih, will remain essentially consultative bodies which lend themselves to becoming vehicles for a populist corporatist base of support for the Islamic regime. Bani-Sadr, around whom coalesce today a whole layer of intellectuals and state-functionaries, can be broadly characterised as a serious Islamic thinker who is interested in laying the economic foundations for an Islamic republic. His relatively more 'rational' attempts to put the economy in order have come into direct conflict with the programme of the clergy to take control of the state machinery (through their majority bloc in the Majlis) and to base all decisions on precepts derived from the Koran and the shari'a. The two major factions of the clergy are the Islamic Republican Party, headed by Beheshti, and those around Kho'ini-ha. One could say that the basic difference between the two is that the former tries to come to grips with post-power problems, trying to make the adjustments and alliances that would stabilise the situation. Kho'ini-ha, on the other hand, wants to remain faithful to pre-power visions of a purist and fundamentalist Islamic social order. The 'students following the line of the Imam' who occupied the US embassy are aligned with this faction. The Hezb-o Allahis (Partisans of God, called thus because of their motto: Only one party, party of Allah; only one leader, Ruh-o Allah [Khomeini's first name]) is a fascistic grouping. It is still small but growing rapidly. It enjoys the support of a number of well-known clerics (notably Hojjat-o al Islam Ghaffari) as well as certain bazaaris. It recruits its thugs primarily from the mass of the declassed urban population. Much of the Iranian far left's propaganda and activity has focused around workers' economic struggles. However, the economic demands, measured by their actual impact on the course of the class struggle, are of secondary importance today. On the other hand, demands related to the nature of the political structure are central and cannot be reduced, as has often been done by the left, to secondary points concerning separation of religion and state and the abolition of all privileges for the shi'ite or any other religion. The specific character of the political system in Iran today, the fact that it is a theocratic Islamic government, shapes all political questions in Iran and must therefore form the central axis of a revolutionary socialist programme. This question cannot be posed simply in terms of secularisation (separation of religion from the state) because of the specificities of Islam as a social and political system. As any Muslim would readily point out, Islam cannot be 'separatedfrom the state', precisely because it is above all else a total governmental social programme. This point cannot be emphasised enough. By turning to Islam, the Iranian masses have not become more religious, but more political- in a very particular and reactionary way. They have turned to Islam as a vision of a future that they mistakenly identify with a betterment of their lives. Like any other political programme that is objectively in conflict with the interests of the toilers and the oppressed, but for political and historical reasons has succeeded in becoming the expression of their rebellion and the focus of their hope, Islam has to be taken up and challenged at every level. Moreover, this challenge is more immediately posed in the case of Islam than any other political formation. The growth of social democracy, for example, indicates an elementary but essential growth of working class organisation. The very power of social democracy rests on the organisation of workers as a class. The recent growth of sentiments for a labour party in Brazil, for example, is a very positive development. Revolutionary socialists welcome it and along with other working-class militants fight for ít (and for their programme) even though, in the given balance of forces between revolutionaries and reformists, it may very well lead to the emergence of a reformist party. Islam, however, is based on the absolute and complete negation of all independent thought or action. It is a deeply antidemocratic view of the world. Its growth, therefore, far from representing any partial step forward for the oppressed, signifies their subordination to the clergy who rest - in theory and not oniy in practict:beyond the accountability of the masses. Its social and economic policies, moreover, are such that they in turn increase the material dependence of the oppressed on religious institutions, rather than encouraging any form of self-organisation (e.g., the disbursement of charities as a means of 'social equalisation'). This means that one cannot deal with Islam as a social and political system without challenging and fighting it all the way down the line. One is almost tempted to counterpose a full socialist programme to the programme of an Islamic society. This, of course, is necessary at the level of the general presentation of revolutionary socialist propaganda. But it too would be inadequate. To focus simply and solely on general anticapitalist and anti-imperialist demands in Iran today is pointless. Power is in the hands of the clergy and the fact that there is a bourgeois government and the mode of production is capitalist is almost irrelevant to the issues of the day and therefore to immediate political tasks. To elucidate this point we will draw an analogy. Israel is a modern bourgeois social formation based on the capitalist mode of production. The struggle between capital and labour is fundamental and must be integrated into the programme of action of Israeli revolutionaries. In this sense Israel is similar to other capitalist countries. But there is a very important sense in which Israel is different from west European countries, for example. Israel is also an exclusively Jewish zionist state. It is a settler state based on the expropriation and expulsion of its former Palestinian inhabitants. These features of the Israeli state pervade all aspects of life in that country. They affect state institutions, laws, culture; and they enter in one form or another as formative ingredients of the consciousness of every citizen of Israel. To arrive at a revolutionary socialist consciousness in Israel, that is, for the Israeli working class to become convinced of the necessity to overthrow the bourgeois state, it is necessary to break with zionism. Left zionists, for example, who consider themselves socialists and are often very well versed in marxism, are in fact the purest zionists of all and they were after all the real pioneers of the modern Israeli state. Anti-zionist demands, therefore, must form the central axis of a revolutionary programme in Israel. The problem for Israeli revolutionaries is to win the masses away from zionism towards socialism; and the chain of demands leading up to that constitutes the specific form that a revolutionary transitional programme takes amongst the Jewish masses in Israel. In other words, anti-zionist demands are not some nice additional touch added to distinguish revolutionary socialists from other currents in the workers' movement. The most militant and explosive struggles of the Jewish masses in Israel will be contained, derailed, and defeated (with arguments such as the threat to the security of the Jewish state, etc. ), unless in the process of struggle the masses begin to break with zionism. Similar observations apply in the case of Iran today. Of course, the Islamic state is different from the example of Israel in the sense that clerical rule is not based on specific material economic privileges of the clergy itself. It is above all a distinct political system. An Islamic political system is distinguished from all others in that it is inherently anti-democratic. In a system based on laws that are not subject to human intervention, questioning and blasphemy, dissent and heresy become identical. No significant Muslim political theorist has ever produced a theory of democracy - of popular rule - and no M uslim state has ever yet rested on political democracy. An Islamic regime insists on forced implementation of what the clergy considers to be in the interest of the Islamic community, based on the Koran, the shari 'a, etc. This is known as the principle of al-amr bi al-ma'rufwa al-nally 'an al-munkar (command the good and forbid the bad). Moreover this body of 'the good and the bad' comprises a whole range of retrogressive laws, social norms and reactionary economic policies. One cannot deal with this phenomenon by tinkering with this or that economic policy, and reacting instinctively, empirically, and on a day-to-day basis to this or that attack on women, the nationalities, the left, etc. One cannot sit back and repeat banalities about capitalism and imperialism, and be content with general anti-capitalist anti-imperialist demands. The specific transitional programme for socialist revolution in Iran must start from the specific political character of the state. The establishment of an Islamic theocratic state is the central fact of what happened in Iran in February 1979. This regime is historically more retrogressive than even the shah's regime. Unfortunately and tragically, the overthrow of the shah's dictatorship has not resulted in any gains for the struggle for socialism. Even the partial improvement of conditions for struggle - purely as a result of the collapse of the dictatorial apparatus and completely unrelated to the nature of the current regime itself - has been more than rolled back by the consolidation of the Islamic regime. Furthermore, the new regime has turned back, and will continue to turn back, the most minimal and partial advance made in such matters as family laws, the legal system, the criminal code. The Islamic constitution of Khomeini, promulgated by the Assembly of Experts, is more backward than its 1906 predecessor. Once the Islamic regime is politically and militarily stabilised, the implementation of its economic policies will also set back the forces of production in Iran for a considerable period of time. Unlike nationalist regimes - Nasser in Egypt, Peron in Argentina, Ben-Bella in Algeriawhich arose in the post-second world war period, and which brought about partial and limited economic reforms (land' reform, partial industrialisation), the Khomeini regime has had and will continue to have a destructive and retrogressive effect on the forces of production. In fact, from a 'socio-economic' viewpoint, the shah, and not Khomeini, was Iran's equivalent to Egypt's Nasser. It was the so-called 'white revolution' that accelerated the partial, uneven, limited, and yet real development of capitalism in Iran. The standard of living under Khomeini' s regime has steadily dropped and it will continue to do so. The dependence on oil revenues will grow as factories and industrial production grind to a halt. At the same time, the production of oil has dropped to less than one fifth of what it was under the shah. The regime is incapable of running the factories without the capitalists who have fled the country. The cumulative effect of all this, in the absence of any alternative, will generate further apathy and demoralisation. Khomeini's regime is also having a very pernicious effect on the general level of culture in Iran. Islamic monolithism of thought is undermining the development of all individuality of thought, nonconformism, and independence. The traditional oppressive Middle-Eastern family structure is given new strength in forcing children and youth into Islamic patterns of behaviour. Religious intolerance has already led to attacks against Christians, Jews, Baha'is, and even sunni Muslims. Revolting and inhumane concepts, like the glorification of 'martyrdom', violence and vengeance, are rampant in Iran today. The effect that all this will have on the future of the Iranian masses, on their thinkers, poets, writers, artists and musicians, cannot easily be measured today. Nevertheless it is frighteningly real, and a very bitter price is being exacted by the clergy in this sphere alone. To conclude: A revolutionary socialist programme for Iran today must include as its central plank hostility to this theocratic Islamic regime and the very idea of an Islamic republic. Every struggle and every demand must be linked up in the press and agitation of revolutionary socialists with the urgency of undermining in every possible way the abomination that has come to power in Iran. Breaking individuals and currents or sections of the masses from the hold of Islam as a social and political system is the only way in which a revolutionary vanguard will emerge that is capable, willing, and effective in struggle against the regime. The break with Islam, therefore, takes on a transitional character in Iran today, in a similar sense to a break with zionism in Israel. It is no longer possible to act as a revolutionary militant in Iran without having arrived at a state of total hostility to the very concept of the 'Islamic revolution' and the Islamic republic. Strikes led and organised against the regime or against capitalists, but on a left workerist Islamic basis, are doomed to failure in the long run, just as purely economic strikes in Israel have always failed to challenge the hold of the ruling class, because they did not challenge zionism, which is the central divide in that country. Are you for or against the rule of the clergy this is the most central political divide that will arise in Iranian society. Given the nature of the Islamic government, based on the intolerant theological concept of 'command the good and forbid the bad', the struggle for political democracy and individual liberties will become the most central issue of the class struggle. The demands and slogans that will arise in Iran will cover a whole range of issues from the most general governmental ones (the struggle for a genuinely popular democratic republic; the convening of a sovereign constituent assembly; demands related to making all governmental offices elective and recallable; abolition of the faghih's post and the so-called Council of Islamic Guardians; democratisation of all election laws; abolition of all restrictions on governmental jobs based on religion; the sovereignty of the legislative, executive, and judicial organs vis-à-vis the clergy; etc.) down to the most specific policies regarding the judicial system (complete secularisation of the judiciary and the laws, establishment of an elective jury system, rights of defence and appeal, abolition of execution, flogging and all such punishments, reinstating the right of women to hold judiciary posts including the post of a judge, abolition of the special courts for the clergy, etc.). One will have to fight also for a whole range of democratic rights (freedom of expression, press, association, etc. ), artistic and cultural freedoms (lifting the ban on music and dance, ending the censorship of movies and theatres; and lifting state control over the mass media, in particular over the radio and TV; ending the strangulation of the universities, etc.). Socialists must also intransigently demand an end to all infringements of individual liberties and state intervention in matters of personal life. As argued above, amongst all the social questions, the national question and women's rights have been and will continue to be the most explosive ones. The struggle of oppressed nationalities for selfdetermination will remain the major obstacle to the consolidation of power by the clergy. Given the nature of Islamic laws regarding women, we shall also witness a rise in the struggle of women for equal rights over the next period. It remains the responsibility of revolutionary socialists to take an active initiative in this field. It is within this general political framework and such a prioritisation of tasks and demands, focusing as they do on the centrality of the question of the Islamic state, that all other points will find their proper place as part of a comprehensive programme for revolutionaries in Iran in the wake of the February 1979 'Islamic revolution'.